Design within context? What is context? Is it a snapshot of the existing landscape and buildings surrounding a project site? Or, is it much more than that? The city of Dallas is undergoing a revolution relevant to its historic condition. Our context is a new set of values emerging from the recent financial crisis coupled with a public that is more informed than has ever been. People are seeking affordable places that can provide long term value, address issues of sustainability, and are relevant to an evolving urban lifestyle. This project sought to address the emerging context. An important goal was to build single-family homes on lots one-fourth that which is typical for the local market. It was important to provide open exterior spaces. Another significant priority was balancing solar orientation with light and views. Besides serving the primary function of residences, this development sought to facilitate community interaction. The outdoor spaces have been designed to serve multiple functions; utilitarian, leisure, and social. 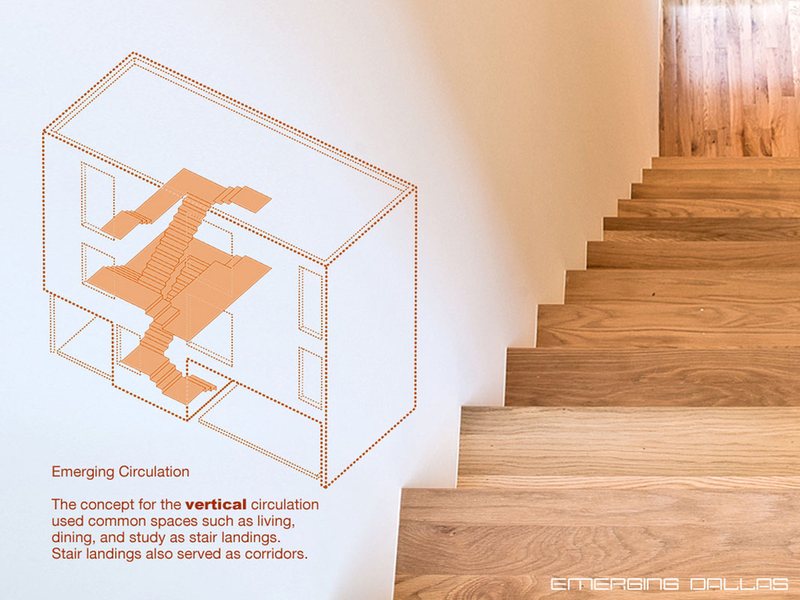 The concept for the vertical circulation used common spaces such as living, dining, and study as stair landings. Stair landings also served as corridors.